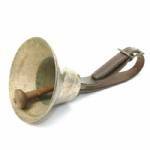 Horses sometimes wore open (liberty) bells rather than sleigh bells. This particular open bell and strap was probably meant to buckle around the bottom of the horse's collar. The bell, originally black with grime and oxidation, was gently cleaned and polished. As you can see from the larger pictures (click "See more images"), the smooth, polished bell is still freckled with dark speckles that would require harsh grinding to remove. Such treatment might get rid of the marks, but it would also alter the appearance and reduce the antique value of the bell. I made a reproduction of the old strap using the original buckle after I cleaned and adjusted it. The new strap is made from dark brown bridle leather.